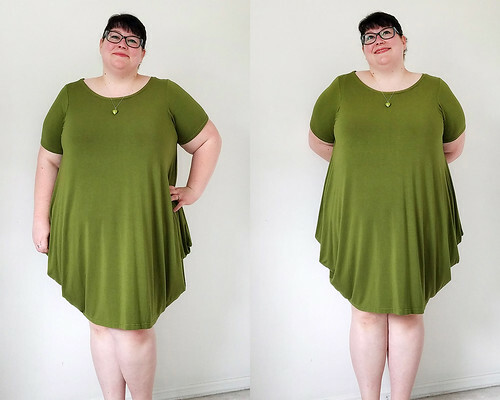 Simplicity 8379: I need at least 5 more of these dresses. This dress came out of nowhere! 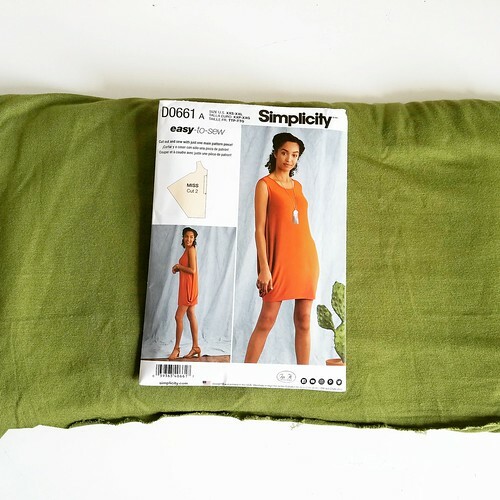 Honestly, I stumbled across the pattern on sale and then turned around and bought some green spandex knit jersey. It wasn’t on my list of things to make at all. 3 hours later I had a dress I am madly in love with. I have had it for 2 weeks and have worn it 3 times. Oh yeah, and when I put this bolt of fabric on the counter to be cut I said something like, “I just love that color!” The lady cutting it replied, “Well, I hate it. I think green is hideous.” Hahaha! What do you even say to that? I love it when things like that happen. You know what’s great about sewing is that it has boosted my self-confidence enough that I didn’t care that she thought I was making something hideous. Who cares? Not me! 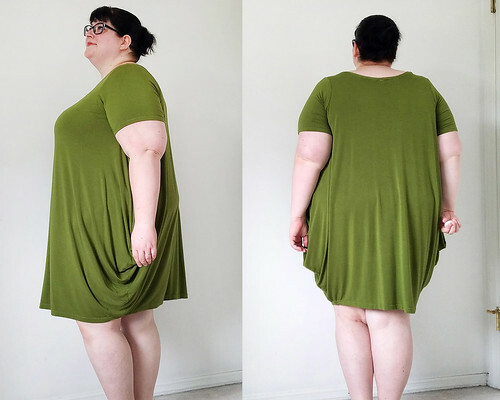 I am usually a 22-24 in RTW dresses. I cut an XXL but I could really go down to an XL. This is very roomy and it is supposed to be. I made only 2 alterations. First I added 2 inches to the length of the dress. It is supposed to be a pretty short dress, but I don’t think my change in length hurt it. I didn’t alter the draping at all. Next I added sleeves. 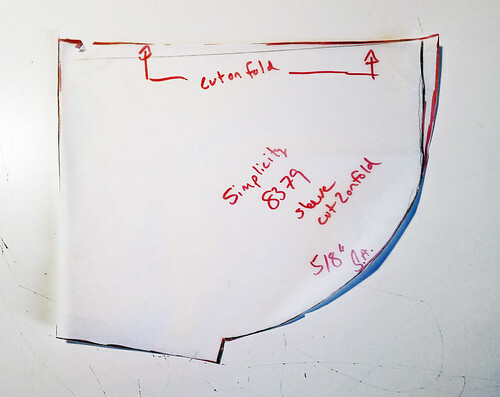 I just followed these sleeve instructions on Kyla Hislop’s blog. The sleeves turned out pretty great! I finished the sleeves and the bottom hem with a twin needle. Easy! The front and back piece are exactly the same. It wouldn’t be difficult to add a v neck or a scoop neck if you wanted to. I added one of my Dutch Label tags so I could quickly tell the back from the front. A lot of times I forget to add the label until it is too late! And here it is! In all it’s drapey, cool glory! I forgot to mention, this dress makes me feel like a cool kid. Oh, and you know what else I love? No Spanx! I like that I can just throw this on and go! I am not pulling up a foundation garment all the time. I highly recommend this dress! Even adding sleeves, I finished this in 3 hours. I just bought some black spandex knit and I will be making another one immediately! I think this green is BEAUTIFUL on you! You look so fresh and that dress looks sooo comfy! Thank you! I think it is my new favorite dress! It’s a lovely dress, andeven just in pictures it’s visible you feel suoer good in it! Also I like that you added sleeves. The original model photo feels a bit meh to me, but I find your version so stylish and comfy looking! Aww. Thank you! Sleeves added on a knit were a no brainer! Had to do it. That’s a wonderful dress, I can’t believe anyone wouldn’t like that color green on you! 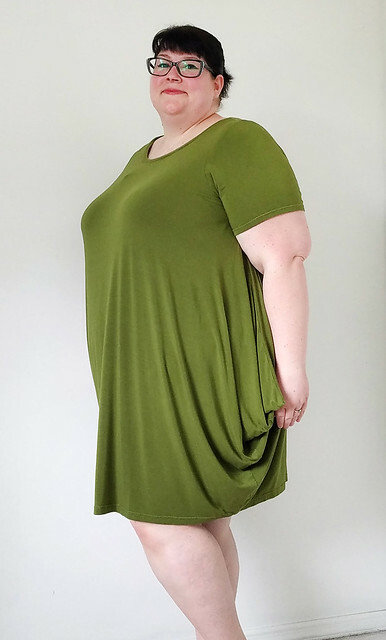 I especially love how drape-y it seems—looks like the perfect combination of comfort and fashion! Thank you! It takes all kinds, right? WoW! 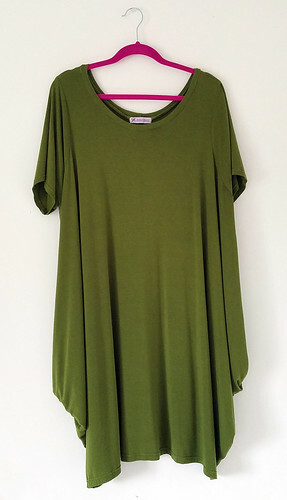 You look fabulous in this color & the style looks super comfy too. 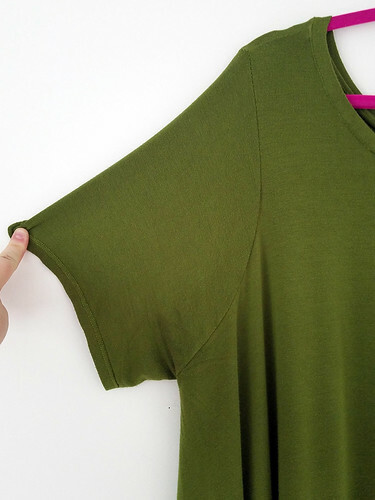 Love the sleeves & so easy & quick to make. Add a sash or belt, some chunky jewelery & you’d have a total different look. What a strange comment to make to a customer. You’d think she’d be trying to make a sale! Anyway, the colour looks great on you. Thank you, I’m really getting into green this year! I agree, it was so unusual, but some people just say whatever comes to mind. I like it on you a lot, it drapes in all the right places and looks very artsy. Colour is flattering on you! Maybe that’s that cool feeling I get, like it’s artsy! Thank you! I have been wanting to make this pattern. Seeing how great this looks, I have to make it. Thanks for sharing. Yay! I hope you post it some where so I can see it! The dress looks lovely on you and drapes really well, and I like the sleeves better on it. Thanks, me too. Although it didn’t look terrible without them, I just wouldn’t be as comfortable. Beautiful dress in a gorgeous color! Haha, Thanks! I think some people just don’t have a filter. They say whatever comes to mind. This is fabulous! I love the green and the draping at the sides is just the right amount. Sometimes these patterns go overboard with the draping, using up lots of fabric and resulting in a funny shaped bag dress. I love this one! Thank you! This is pattern got it just right, I think. It’s still a bag dress, but I think I’m really getting into those! I am running right out for this pattern!! Love your dress and that color looks fab on you! Yay! I hope I get to see your make! Love the color! I’ve go to make this pattern! Ha-ha on the fabric lady. She’d better hope her boss didn’t hear her say that–supposed to be well-representing the store. Tsk-Tsk. Well, enough of that … Love, love, love that dress on you. The color is just right. By all means, make more. So many possibilities…longer sleeves, shorter length to wear with slacks or leggings, different necklines, color blocking–this is a great pattern. That’s true! Someone just said they might add a color block band to the bottom. I think that would look cool. green hideus? tststs…. I’m with you girl,love the colour and you look fabulous wearing this dress! Looks great. Thanks for the sleeve instructions. Perfect timing! I was wondering how to add sleeves to a garment. Can’t wait to see more off them. Good! I thought the instructions were easy to follow. Your brilliant!!! Sleeves!!! This small detail took this drew to a new level! I love this color! Great dress! Haha! Thank you! It was such an easy addition and made it a dress I can wear ALL the time! Gorgeous! The shape is beautiful and I absolutely love the style! Thank you! I’m in love with it. I highly recommend it. I like the color. It’s one of my favorite greens. Thanks! Me too. I think it is my favorite color this year. I need one of these! What a great, simple dress. Thank you! I am about to make another one in black with a v-neck. I cannot recommend this pattern enough! I would love pockets. 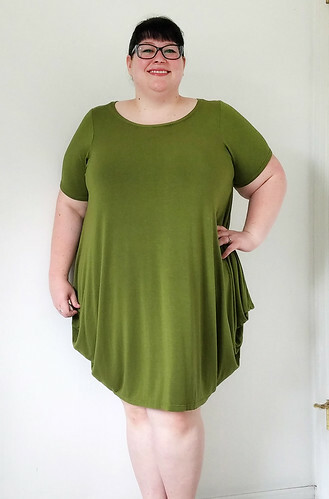 I haven’t tried, but I am not sure the dress would keep it’s shape with the extra weight. It’s worth a shot though! This dress look Amazing on you! I absolutely Love Love Love the color!! I planning on making this dress, but first wanted to see if anyone made it with sleeves. I’m so glad I saw yours! Love it! You said you added 2 inches to the length, can I ask how tall you are? I’m only 5 foot 3 inches, but it would be a mini dress on me without the extra length! Also, thank you! I hope you like it as much as I do! I found your blog through a link from Sie macht. Loved your review and photos so much that I bought the pattern and sewed it right up. It’s a fun dress, easy to make and to wear. I wouldn’t have noticed it without you guys reviewing it, so thank you! Awww, thank you! I find that it helps to see other people’s makes to truly decide if I would like a pattern. Glad you like it. I wear mine at least once a week! I did not alter the shape. I added the extra length to the hemline and since the side seams are angled I took a ruler and continued that line to the new hemline. Hope that makes sense! You could certainly reduce the angle. I used 50% stretch fabric, if I recall, so the more narrow hem doesn’t hinder me at all.